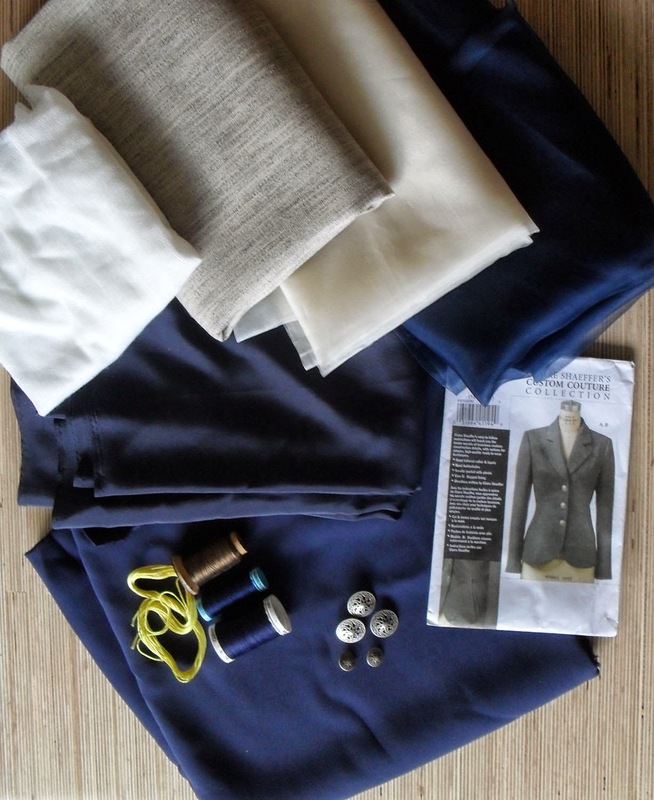 This is a picture of all my materials except the twill tape which I forgot to include. The fashion fabric came from http://www.tessuti-shop.com/products/claudia-blu and was bought by my boss as a bonus gift - it is Italian Designer double crepe - 50% Viscose 48% Acetate 2% Elastane. . The lining is silk crepe de chine that I purchased ages ago from CDC on aliexpress - direct from China. 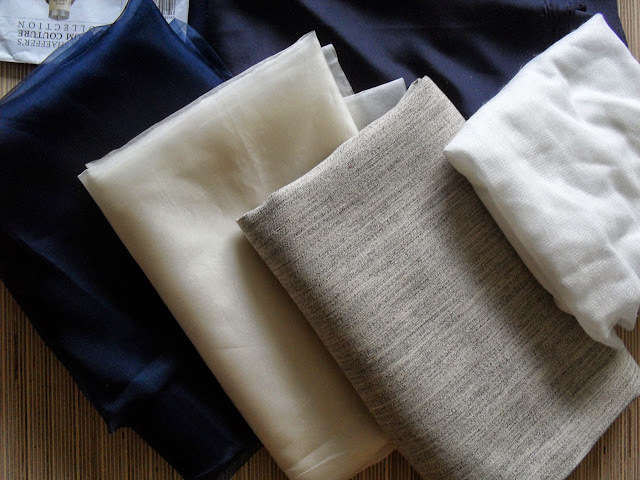 I buy alot of silk this way as it is alot cheaper and there is a large range of colours. The silk organza's were from China via aliexpress, hair canvas, fusible interfacing and twill tape from my local fabric store. The buttons, shown here on the fashion fabric. I spent alot of time considering various jacket sets of buttons on esty and ebay - there is a huge selection and I was tempted to buy a set of vintage chritian dior buttons - but my jacket is by me, not christian dior. I also considered some very plain vintage buttons which were very expensive once freight was added. In the end I really liked these filagree buttons, made in italy, which were reasonably priced as was the freight and came in a variety of sizes. 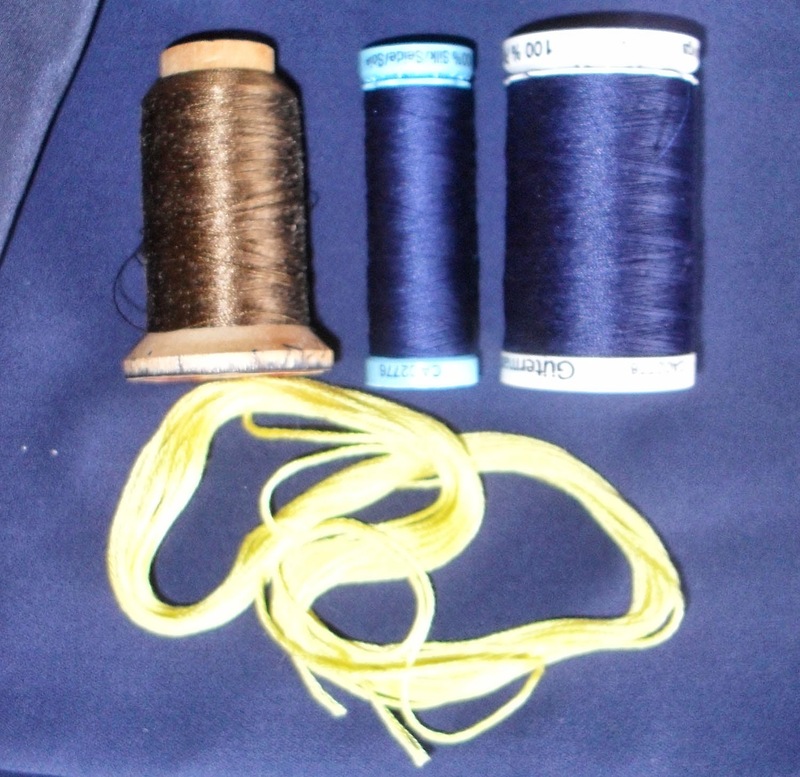 The thread - brown silk basting thread for basting prior to machine sewing, matching silk thread for pad stitching (my pattern says silk is used for tailoring as it has more flexibility), polyester all purpose for construction and yellow embroidery thread for basting silk organza to the fashion fabric. All came from my local fabric store except the brown silk basting thread which I purchased from Susan Khalji's website last year when I took her couture dress couse.